eHealth Consortium is pleased to announce a free seminar in 2016 for members and the public, with the aims to boost the awareness of ehealth adoption for improved care delivery. Limited seats available, REGISTER NOW! As technologies drive every single process in our daily life rapidly, workforce and professional training as a core part of healthcare organizations, there are a brunch of innovations over past ten years. Mr. Ian Lee will share how current technologies help to improve executive insight and decision-making while ensuring organizations have the right people with the right skills doing the right work benefit by the available technologies to manage and develop health care professionals effectively, to meet compliance, to do workforce planning for organization future development. Mr. Ian Lee has more than 10 years experience to work with different sector all around the world for consultation and implementation about technologies and usage of Human Capital Management. Mr. Raymond Kuo has more than 15 years consultation experience for cloud-based technologies across the region. Deadline for registration is 16 September 2016. 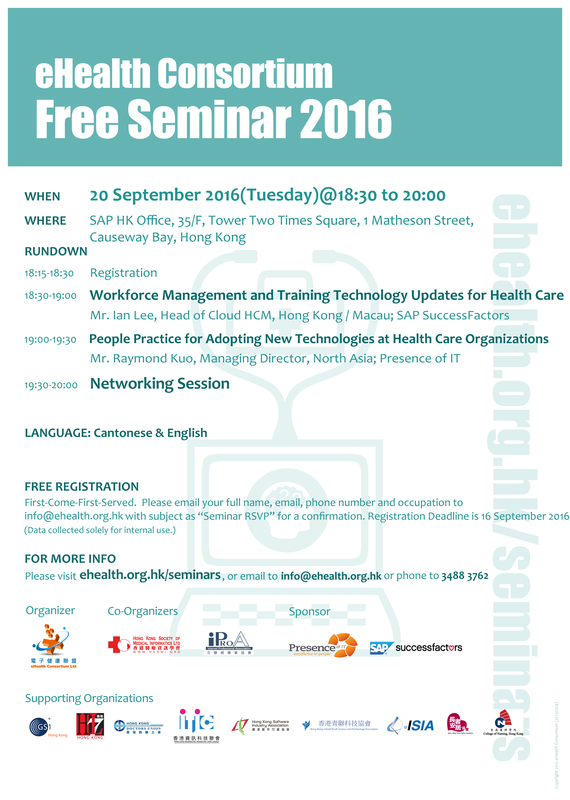 Please email your full name, email, phone number,occupation and company name to info@ehealth.org.hk with email subject as 20 Septemeber Seminar for a confirmation. eHealth Consortium is pleased to announce a quarterly seminar series in 2016 for members and the public, with the aims to boost the awareness of ehealth adoption for improved care delivery. (Updated on 7 September 2016) Stay tuned for information on our next seminar!